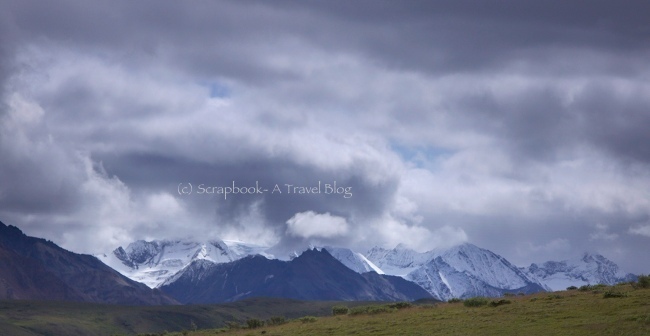 Alaska is one mysterious place and Denali National Park in Alaska is a wonderful place. Vast tundras, green rolling hills and behind all this hiding are the snow capped mountains. The thick clouds in the sky add to the beauty of the place. I took this picture on the way to Wonder Lake campground. In the beginning the cloud covering was low and thick and I was not able to see the mountains. Then the clouds moved a little up and the scene cleared for very few minutes for me to click this :) Amazing huh? Awesome mountains, Kusum, and a breathtaking capture! Thanks for sharing! Have a lovely weekend!! Very, very nice! Happy skywatching. What a lovely view of the mountains! I would love to visit Denali someday! Have a happy weekend! awesome! you've been everywhere in the usa. beautiful! This place is where Into the Wild is based? Never saw it before on a blog. Awesome shot! The composition looks fantastic.